Manimahesh Lake (also known as Dal Lake, Manimahesh) is a high altitude lake (elevation 4,080 metres (13,390 ft)) situated close to the Manimahesh Kailash Peak in the Pir Panjal Range of the Himalayas, in the Bharmour subdivision of Chamba district of the Indian state of Himachal Pradesh. The religious significance of this lake is next to that of the Lake Manasarovar in Tibet. 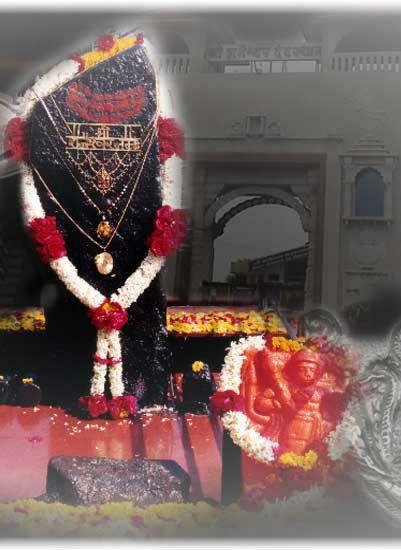 According to one popular legend, it is believed that Lord Shiva created Manimahesh after he married Goddess Parvati, who is worshipped as Mata Girja. There are many legends narrated linking Lord Shiva and his show of displeasure through acts of avalanches and blizzards that occur in the region. 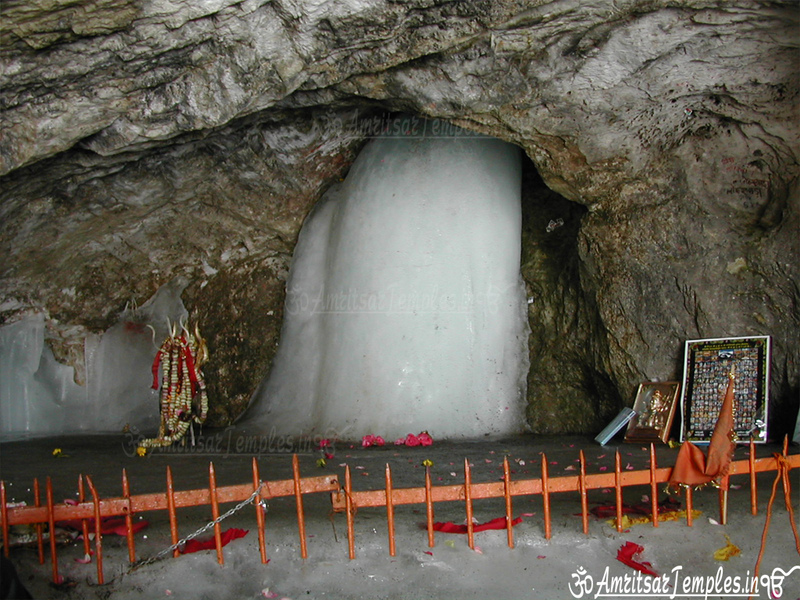 Legend also mentions that Shiva performed penance on the banks of Manimahesh Lake. In the same vein, it is mentioned that Gaddis, the tribes of this region, adopted Lord Shiva as their deity. 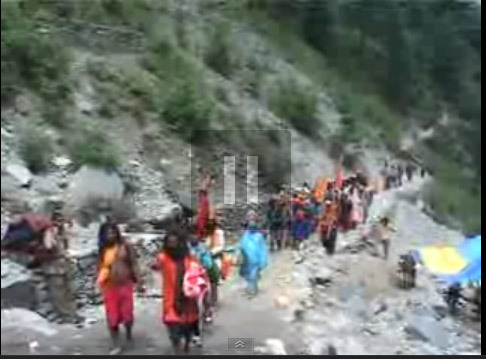 Gaddis are the people who reside in the Gaddi Valley which is the name of the upper regions of Ravi River where the Mount Chamba Kailash lies. Further, according to the legend, the Shiva, who lived in Mount Kailash, the highest mountain of the state, gifted the Gaddis with a Chuhali topi (pointed cap), which they wear traditionally along with their other dress of chola (coat) and dora (a long black cord about 10–15 m long). The Gaddis started calling the land of this mountainous region as ‘Shiv Bhumi’ (“Land of Shiva”) and themselves as devotees of Shiva. 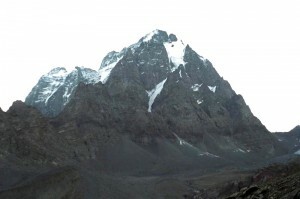 The legend further states that before Shiva married Parvati at Mansarovar Lake and became the “universal parents of the universe”, Shiva created the Mount Kailash in Himachal Pradesh and made it his abode. He made Gaddis his devotees. The land where Gaddis lived extended from 15 miles (24 km) west of Bharmaur, upstream of the confluence of Budhil and Ravi rivers, up to Manimahesh. 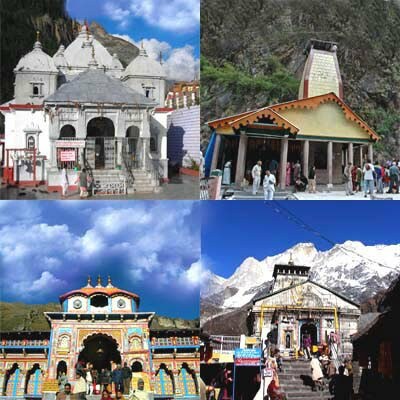 Manimahesh was also considered the abode of the three Lords of the universe namely, Shiva, Vishnu and Brahma. 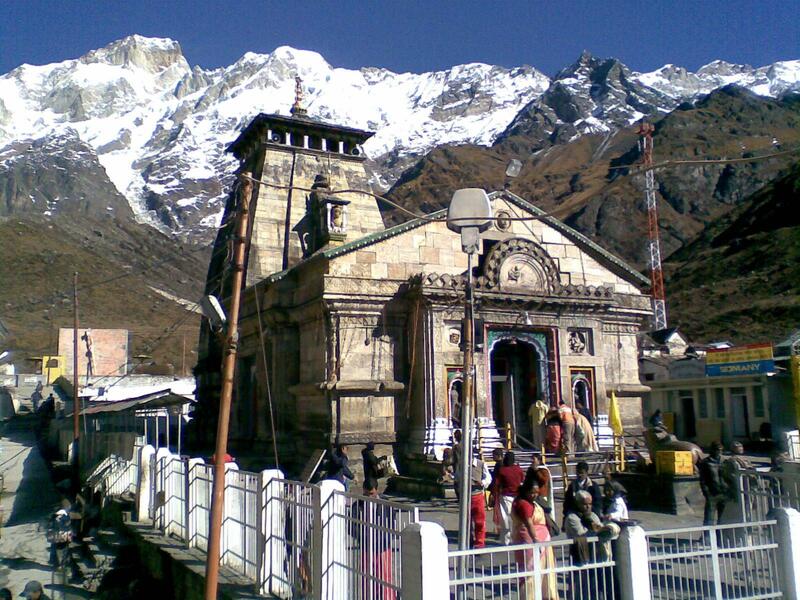 Manimahesh was reckoned as the heaven (Kaliasa) of Lord Shiva. The waterfall seen at the Dhancho on the way to Manimahesh Lake, and which emanates from the lake, was considered as the heaven (Vaikunta) of Vishnu. The heaven of Bramha is cited as a mound overlooking the Bharmaur city. The Gaddis also believe that Shiva resides in the Mount Kailash for six months, where after he moves to the netherworld handing over the reigns to Lord Vishnu. The day he departs to the netherworld is observed by the Gaddis reverentially every year, which is the Janmashtami day, the eighth day of the month of Bhadon (August), the birthday of Lord Krishna (an incarnation of Lord Vishnu). Shiva returned from the netherworld to Bharamaur at the end of February, before the night of his wedding and this day is observed as the Shivratri day, Gaddis observe this also as a festive day since Shiva and Parvati returned to Mount Kailash in the Gaddi land. Etymology of ‘Manimahesh’ signifies a “jewel (Mani) on Lord Shiva’s (Mahesh’s) crown”. According to a local legend, the moon-rays reflected from the jewel can be seen from Manimahesh Lake on clear full moon night (which is a rare occasion). However, it has been inferred that such a phenomenon could be the result of reflection of light from the glacier that embellishes the peak in the form of a serpent around Shiva’s neck. A legend in which Lord Shiva himself is tricked is narrated. 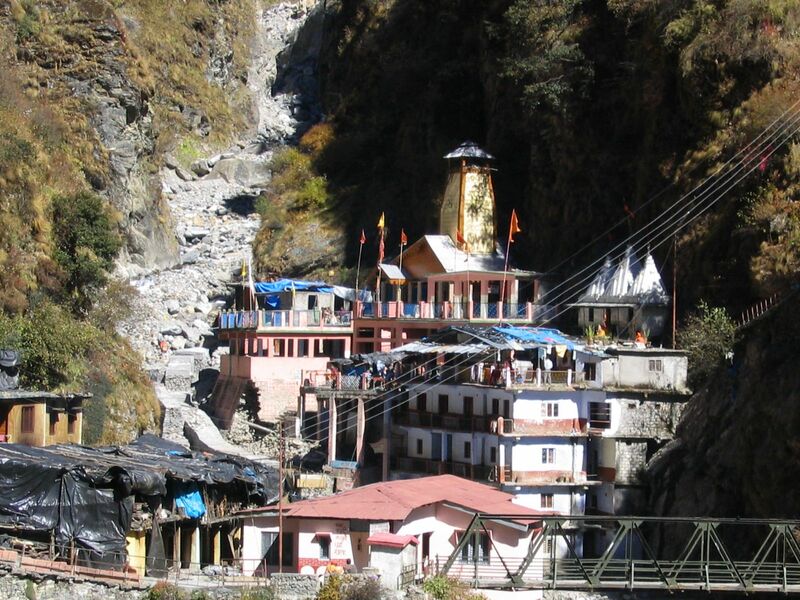 According to this narration linked to Dhancho where pilgrims spend a night on their way to Manimahesh Lake, Lord Shiva, pleased with the devotion of one his ardent devotee Bhasmasur (an asura or demon) bestowed a boon, which gave powers to Bhasmasur under which Bhasmasur touching any one would reduce that person in to ashes. Bhasmasur wanted to try this boon on Shiva himself. He, therefore, followed Shiva to touch him and get rid of him. However, Shiva managed to escape and enter into the waterfall at Dhancho and take shelter in a cave behind the rolling waters of the fall. Bhasmasur could not get through the waterfall. Then, Lord Vishnu intervened and killed Bhasamasur. Since then the fall is considered holy. A rare event of the first sun’s rays falling on the Mani Mahesh peak is seen in reflection in the lake like saffron tilak. 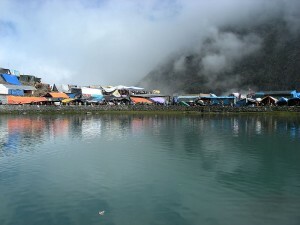 This display in the lake has enhanced the legendary belief of the Gaddis on the sanctity of Manimahesh Lake at the base of the Mount Kailash, which they visit on an annual pilgrimage. This event has also contributed to the practice of taking bath in the lake on Janmashtami day or Radhashtami day, fifteen days after the birth of Lord Krishna. 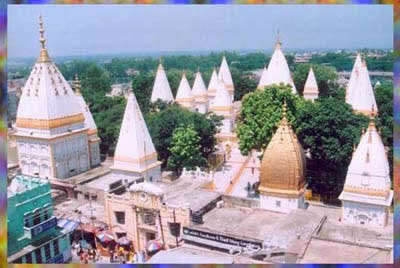 Life in Bharmour, or Brahmpura as the ancient capital was known, centres around the Chaurasia Temple square, which owes its name to the 84 shrines built within its periphery. The beautiful shikhara of the Manimahesh Temple dominates the square while a life-size image of Nandi in polished brass stands before it. According to one legend, 84 yogis visited Brahmpura during the reign of Raja Sahil Verman. Pleased with his hospitality, they blessed the raja with 10 sons who in turn erected the temple complex. Another story goes that Shiva, accompanied by 84 yogis, stopped at Brahmani Devi’s vatika (garden) on his way to Manimahesh. The devi, displeased by the trespassing, ordered them out of the place. However, at Shiva’s request, the devi consented to let them stay and the yogis turned themselves into lingas. According to another version, the 84 yogis paid no heed to the goddess, who turned them into stones in a fit of rage. Although each temple in the complex enjoys its own history and sanctity, some of the more important temples in the complex are those of Sri Manimahesh/ Harihar, Nar Singh, Lakshna Devi, Ganesh, Shiva Davala, Nandigran, Mahadev, Shivalaya, Sitla Devi, Ardh Gaya and Dharamraj/ Yamraj. 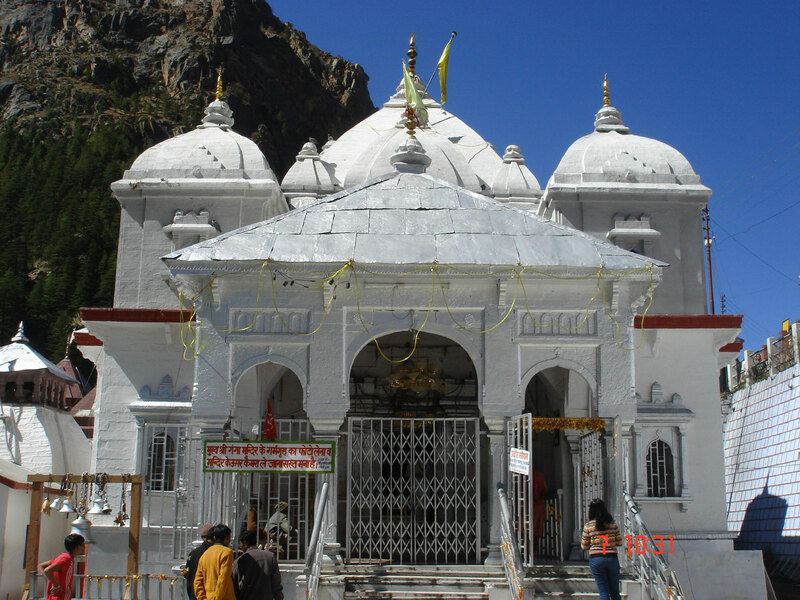 Built in shikhara style, the predominant temple is that of Manimahesh. While the woodwork in the Lakshna Devi Temple to Durga is superb, the Dharamraj/ Yamraj Temple at the northern corner of the complex is made of stone and wood and has a pendant roof. 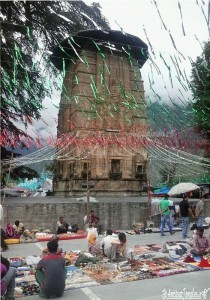 It is believed that souls of the departed pass through this temple on their way to Shivaloka, ie, Kailash. The court of Chandragupt is located right in front of this temple. He is believed to keep records of each individual’s good and bad deeds.